In 1996, Classic Warship Publishing released Warship Pictorial Number 1: USS Indianapolis (now out of print). I was fortunate to receive this as a gift, and found myself going back to it time and again to read it. In 1997 and 1998, pictorials on the USS Minneapolis and USS Louisville were released. This was followed in 1999 by the fourth book on the USS Texas. Since then, the pictorials have came fast and furious. The earlier profiles from Classic Warships focused more on individual ships. Starting with the sixth pictorial on the Omaha-Class Cruisers, the focus became more on a class of ships, instead of one in particular. Warship Pictorial Number 9: Yorktown Class Carriers covers the lives – in pictures – of the 3 carriers of the famous Yorktown-class: Yorktown, Enterprise and Hornet. These three carriers were at the forefront of the fighting during the dark days of 1941 and 1942, when victory in the Pacific was no sure thing. At one time in 1942, both Enterprise and Hornet had the distinction of being the only operational U.S. carrier standing between the Japanese and the Marines on Guadalcanal. The Yorktown Class Carriers is laid out in three ‘sections’, each devoted to a different ship, starting with the class leader. Each section begins with a history of the ship. 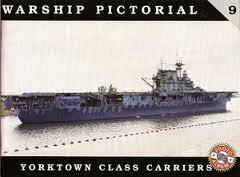 The Yorktown has five pages devoted to her, while Enterprise – which was in service longer – has two pages. The Hornet – who’s career lasted less than a year – has one page. The pictures are crisp and clear and laid out in a easy to read fashion, most with captions explaining what time period the photo represents, or pointing out differences between similar photos at various points in the ship career. Many of the pictures are familiar, but some I’ve never seen before. That doesn’t mean they haven’t been published before, but considering the Yorktown-Class is my favorite class of ship – and the Yorktown my favorite ship – I‘m willing to bet that some pictures will be new to most of you. If you like the lines – and history – of the Yorktown-class, I highly recommend this book.